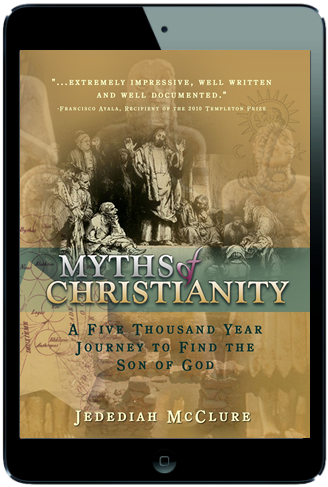 In clear, straightforward terms, Jedediah McClure sifts through centuries of myths and traditions and assembles extensively researched scholarship into an engaging and relatable account of Christianity’s origins. McClure examines the development of core Christian doctrines through the lens of the chaotic era in which this religion took root: an era dominated by foreign occupation and pagan influence, overshadowed by the destruction of Jerusalem – and with it Jewish nationalism – and inundated in apocalyptic fanaticism. Countless prophets, preachers and charlatans alike trekked across the empire performing “miracles” and spreading their own versions of the Word of God. This was an age of confusion and competition – where rival Christian leaders competed with each other for followers; where access to authentic “gospel” texts were in limited supply while countless contradictory “gospels” vied for legitimacy; and where long-standing local traditions from region to region altered the manner in which Christianity was practiced. You may return unused, undamaged paperback books within 14 days of delivery for a full refund. If a book was damaged during shipment, please contact us for replacement. Most refunds are fully refunded in 3-5 days after we receive and process your return, but the entire process can take up to 3 weeks for charges to be refunded to your credit card. We do not offer refunds on e-Books. If the file you received is corrupted or damaged, please contact us and we will provide you with a workable file for download. *All credit card payments are processed in the U.S.A.